Depending on which Mets fan you talk to, this is either the greatest news in team history, or the death knell of the organization. Yes, it seems when it comes to opining about the Mets’ former second baseman, there is no middle ground. The very mention of Wally’s name sets off in-fighting the likes of which haven’t been seen since the 1860s. So, putting emotion aside, what kind of future does Backman have with the Mets, or with another organization in Major League Baseball? Most Mets fans remember Backman fondly as the grinding, contact-hitting, uniform-dirtying second baseman from the winning Mets teams of the 1980s. After Backman retired, he began his managerial career in 2002 with the Birmingham Barons. That year, the Barons went 79-61. He continued his winning ways into 2004, when he won Sporting News “Minor League Manager of the Year”. That year, he managed the Arizona Diamondbacks’ High-A team to an 86-54 record. That November, Backman was named manager of the big club in Scottsdale. In a surreal turn of events, just a day later, on HBO’s Real Sports, Bryant Gumbel (making yet another stellar contribution to sports) reported that Backman had been arrested in 1999 for DUI. It was also reported that Backman had filed for bankruptcy to avoid paying the IRS and other creditors (Seems Backman and Lenny Dykstra had more in common than just setting the table for the 80s Mets). The Diamondbacks stood by him for exactly three days before firing him for lying about his past. This turn of events has marred Backman’s reputation to this day. However, like in his playing days, Backman has pressed on despite the odds. He’s attempted to rebuild his career, managing at any level to try to reach his goal of managing in the big leagues. His turn with the independent South Georgia Peanuts produced a 59-28 record and a viral video (WARNING: NSFW Language). He has since returned to the Mets organization, managing at Class A Brooklyn and Class AA Binghamton. With Tim Teufel now filling the role of 3rd Base Coach for the big club, Backman would likely be the manager of AAA Buffalo, should he stay with the organization. While in the Mets organization, he has reportedly connected with his players. Record-wise, the B-Mets got off to a rough start this year, but came on strong at the end of the season (with a boost from the promotions of Matt Harvey and Jeurys Familia). Backman was considered a candidate for the Mets’ 2012 bench coach job, but the Mets decided to go with Bob Geren. Backman’s critics took this to mean the Mets would rather have Wally from Leave it to Beaver in their organization than Wally Backman. Before hiring Geren, however, the Mets stated that they were looking for an experienced Major League bench coach. Geren, a former Major League manager, fit that bill. Backman, despite technically being a big league manager for four days, did not. So, at best, the Mets will further evaluate Backman as manager of the Buffalo Bisons. If he does leave the organization, he will likely get a good, hard look from another team. But can he manage in the Major Leagues? To his critics, he would be the worst manager since Bill Lumbergh. To his supporters, he’d be a great motivator, and teach his players how to play like he did back in ’86. The truth is, as a minor league manger, he has garnered little criticism from his players. The question is, will his aggressive style and bold personality wear out its welcome with Major League players? And the largest concern seems to be with his off-the-field issues. Backman wouldn’t be the first manager with off-the-field issues. Ron Washington has tested positive for cocaine, and has admitted using the substance. Has it hurt his on-the-field performance? Yesterday he led his Texas Rangers to their second consecutive AL pennant. 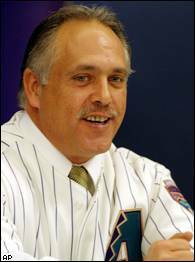 So, can Wally Backman be a Major League manager? Yes. Can he be a good Major League manager? Everyone can speculate, but the plain truth is, nobody knows. The fact that the Mets haven’t given up on him is a good sign. The fact that he has connected with his players at the minor league level is a good sign. But his volatility on and off the field is a legitimate strike against him. No matter how successful he is, he will be entertaining and he will be controversial. In the context of the sports business as entertainment, that’s often a winning combination. Back Mets Grab Geren – But Who is in Charge? Hmm, reading this it sounds like maybe you should replace Teufel’s name with Backman or just add it with Teufel’s in your other article, or perhaps the Wilpons are running the show to the same extend they did pre-Alderson and the only hope for the future is still new ownership. Wally’s back! SNY reported yesterday. He will be triple A coach. The other thing in this article is the STARK difference in opinion and sight of Omar and SP. Thanks Mic, you’ve inspired a post. We wish the best to Wally and his career.